Guitarists love to hear other guitarists talk about their craft. 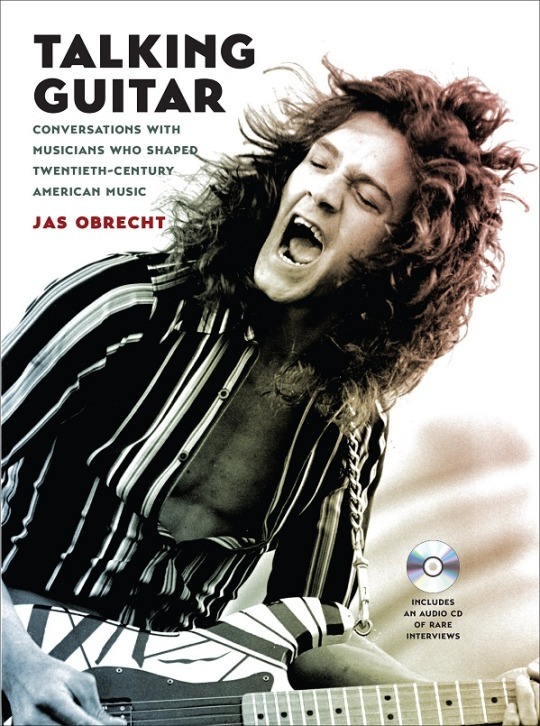 Jas Olbrecht, former editor of Guitar Player magazine, has had the honor of speaking with some of the most famous guitarists in history from diverse genres, and a number of those interviews are collected in the volume Talking Guitar: Conversations with Musicians Who Shaped Twentieth-Century American Music. From the blues guitar of Clarence “Gatemouth” Brown to the rockabilly stylings of Ricky Nelson, the philosophy of the Grateful Dead’s Jerry Garcia to the two-handed tapping of Eddie Van Halen, Talking Guitar has a little bit for everyone. The Van Halen interview is especially interesting as it was an unscheduled sit-down with the up-and-coming guitarist after Olbrecht was blown off by Pat Travers. After playing a game of one-on-one basketball and explaining his predicament, Van Halen said, “Why don’t you interview me? Nobody has ever wanted to interview me?” He introduced himself, Olbrecht started recording, and Eddie Van Halen’s “first major interview” was underway. Johnny Winter went on record about open tuning and slide technique, Carlos Santana speaks to the importance of tone and emotion, while Tom Petty talks about understanding rhythm guitar and how important Mike Campbell’s lead work was so important in Petty’s success. Talking Guitar also features interviews with Nick Lucas, Ry Cooder, Barney Kessel, Roebuck “Pops” Staples, Carol Kaye, Stevie Ray Vaughan, James Gurley, Gregg Allman, Neil Young, Eric Johnson, Joe Satriani, and Ben Harper. Also included is an audio CD that includes excerpts of the interviews, including Eddie Van Halen explaining how “Eruption” ended up on the debut Van Halen record, and James Gurley explaining how John Coltrane influenced psychedelic guitar. Talking Guitar is a fascinating collection of interviews, highly recommended for aspiring rock stars. Learn more about University of North Carolina Press. Purchase Talking Guitar by Jas Obrecht.